When you become interested in cephalopods at the age of ten, and your family and friends get wind of this strange obsession, then by the time you're thirty you've got a house full of cephalopod clothing, cephalopod kitchenware, cephalopod artwork, even cephalopod drawer handles. But when you're the daughter of said cephalo-freak? Well, the accumulation of cephalo-gear starts before you are even born. And by the time you're two months old? Well. My two-month-old daughter, surrounded by HER cephalopod swag. Amazing handmade box. The baby bottle, in case you can't see it, is decorated with a robot to honor my husband. Entirely identical blue octopus puppets. Given by two entirely non-identical people who do not know each other. Captain Calamari, who despite the name is clearly an octopus not a squid. Given in conjunction with Rusty the Robot (see note for #1). 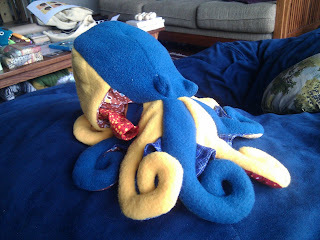 Sew Your Own Sock Squid Kit. I forgot to include this in the original picture, so I had to take another picture and stitch them together in this incredibly skilled way. Octopus counting puzzle: the eight arms are labeled 1-8, and the eyes are 0 and 9. How satisfying. Octopus page of the book Squishy Turtle and Friends. Octopus from the Fill & Spill Fishbowl. Onesie decorated with Haeckel's classic octopus illustration. 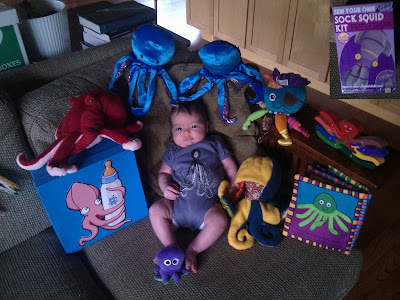 At this rate, by the time my daughter is ten she will have accumulated over 600 pieces of cephalopod paraphernalia. Fortunately, by that same time (and probably much, much earlier) she will also have accumulated her own eccentricities, and her gifts will be altered accordingly. Important Note: This will not be turning into a baby blog. Never fear. (Or--fear, if you like. Sorry, grandparents.) In fact, I have Big Plans for blog content, starting around my kid's six-month birthday in May. Until then? Well, I have all these new toys to play with . . . I'd say the red one is a baby GPO - it lacks the eye flaps (and also more safe for human babies). Of course, you are right! I stand corrected.